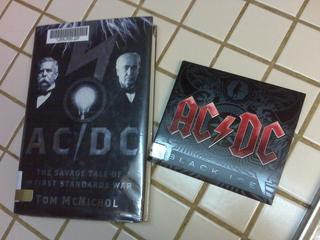 Boomers: AC-DC, or Is the Library Great or What? A few weeks ago, I went to the Humble Rodeo, which, by the way, isn't a rodeo at all, with sons, daughters-in-law and grandkids. The boys got a sweet gig there - judges in the BBQ cookoff. Anyway, we wandered around, went to the petting zoo, got some kettle corn, fried turkey leg, sausage on a stick, funnel cakes, you get the idea. One of the local businesses had some tables set up and said it was fine for us to sit a while. They even brought us some complimentary beers! Really nice folks - D&D Collision. They had some decidedly non-rodeo music on. I think it was our classic rock station. While we sat there, they played a block of AC-DC. Kind of got me in the mood to listen to a little more. Where do you go when you want to listen to a little AC-DC if you don't have the CDs or anything on you iPod? The library, of course. You order up aCD, check it out, take it home, and listen. When it's due, you take it back. While I was checking out the catalog for AC-DC, I found another engineering dork AC-DC item. Is there such a thing? You bet. Here they are. On the right is AC-DC's Black Ice CD. On the left, AC/DC. I'm just starting this one. It's the first real standards war - the bitterly fought struggle between the proponents of alternating and direct current to see which would be our electricity standard. Beta vs VHS or BluRay vs HD was nothing compared to this. Just thought the similar titles and cover appearance with one being screaming rock and the other being a standard war fought in the 1870s was sort of interesting, at least to an old engineer who likes old rock and old engineering stuff. Why am I not surprise! ?